Kon-Boot is a only application which will silently bypass all the Admin/User login authentications of Windows based operating system without changing the default password.This is the only tool which will help you to login in any windows based operating system of which you are not knowing the password.It is easy to use and very fast application. Kon-Boot is mainly created for Ubuntu,but now it supports more Linux distributions. 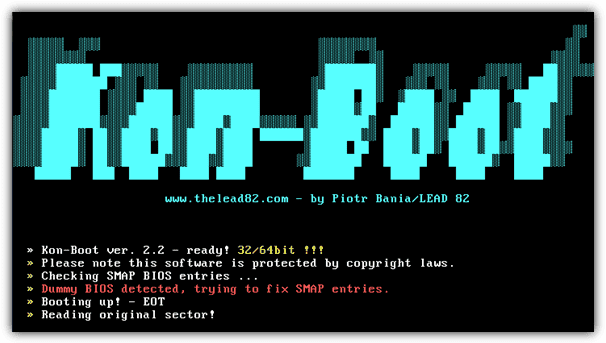 Kon-Boot can also crack an array of Windows and Linux operating system ranging from Windows XP to Windows 8.1,which makes it one of the first tools to break Windows 7 passwords.On the Linux from it supports Gentoo,Ubuntu,Debian and Fedora flavors. By using this application you can bypass login authentication of the above mentioned operation system. Download the Kon-Boot from the download button given below. Download the Kon-Boot from download button given below. Open the Kon-Boot folder,you will find a .exe file with name "KonBootInstaller",open it. If you get a warning about detaching all usb devices,etc,just ignore it and click on "ok",a new window will open with three installation methods first one will be install to CD(no EFI support),second one will be Install to CD(v2.1,no EFI support) and third install to USB disk(with EFI support).I have used the third option as pendrives are much faster then CD's. Once installation completes,just remove your device safely.Sometimes the installer stops not responding,just chill and wait for few minutes,when installation gets over,you will see a message about installation has been completed.If installer is not responding and have take more than 5 minutes,then you need to end the process and restart it as the application might get crashed. Your kit is now ready after the installation has completes,so next step is to insert your respective device(CD/Pendrive) in which you have installed the Kon-Boot. Boot from the device in which you have installed the Kon-Boot. Hit enter to continue at the splash screen. When you are asked for password to login,hit enter.Thats all,no files are written to the disk by this utility.None are modified either.If you are getting error message then type anything in password field and you will be logged in. After your work is finished,reboot without the CD/Pendrive in which you installed Kon-Boot and you are back to the original password of Computer/System. If you want to change the password of the system permanently,for windows,after login in the account,open cmd as administrator and type the following command "net user".This command will list the user account of the computer.Then type "net user Your_Admin_LoggenIn_User_Name password" where password will be the password which you want to keep and Your_Admin_LoggenIn_User_Name is the name of the user account you logged in.The password will be permanently changed by executing this command. Note:The file is password protected for security reasons.If you are really interested in using this application,please contact us through contact form or by emailing us for getting password.We will give you the password of the file within 24 hours. FOR MORE INFORMATION,JOIN OUR NERD PROGRAMMER FACEBOOK GROUP. Execute Any Bat/Cmd File Invisibly/Silently. Website Hacking Using The OpenCart Vulnerability.